Brahm Callahan is the beverage director for Himmel Hospitality Group, which operates three restaurants in the Boston area. He became a certified sommelier at age 24. When customers at Boston’s Grill 23 & Bar steak house relish the moment of picking a Cabernet Sauvignon to complement their dry-aged cut, they’re benefiting from the results of Brahm Callahan’s decade-plus experience in fine wine and education. 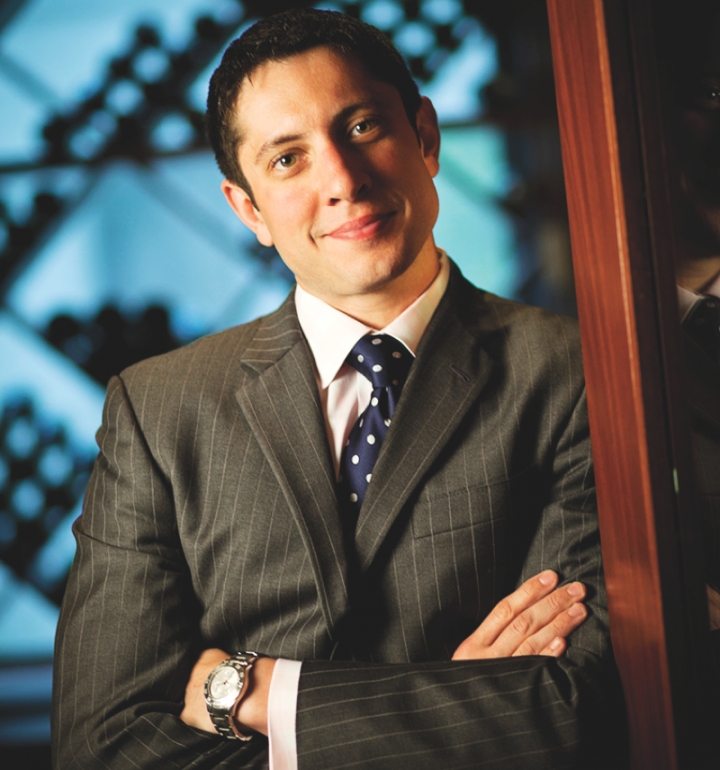 The 31-year-old Callahan, who serves as beverage director of Grill 23 operator Himmel Hospitality Group, passed the certified sommelier exam from the Court of Master Sommeliers at the age of 24. At the time, he managed the wine program at the now-closed Excelsior restaurant after starting his career with Shelburne Falls Wine Merchant in Western Massachusetts. “I was pretty young and baby-faced,” he recalls. “Customers weren’t taking me seriously, so I took the introductory and certified exams. If a customer pushed back, I would mention I was a certified sommelier.” Callahan joined Grill 23 in Boston’s Back Bay neighborhood as wine director in 2011 and earned the highest title of master sommelier this past May. He was promoted to his current position in August and now oversees Himmel’s three restaurants, which also include Harvest in Harvard Square and Post 390 in Back Bay. Even the best wine lists can fail at the table if servers are inadequately trained. Callahan is dead serious about Grill 23’s carefully cultivated, 1,700-bin wine list—a Wine Spectator award winner—and conducts rigorous staff training. “Education is a big part of selling,” he explains. “My staff needs to be comfortable with the list.” Grill 23 employs 12 certified sommeliers, and one just passed the advanced exam. Grill 23 launched more than 30 years ago and remains relevant with creative promotions such as its $23 wine list on Sundays and Mondays. “I use that menu as a platform to show more unique wines from lesser-known terroirs, such as Primitivo or a sparkling Grüner Veltliner,” Callahan notes. His personal favorite is the 2013 Domaine Guillemarine Picpoul de Pinet from France’s Languedoc region. “It’s an unusual white that has high acid, is crisp and refreshing, and goes great with shellfish,” he explains. Top-selling bottles on the $23 list include the 2013 Beyond Sauvignon Blanc from South Africa’s Coastal Region, the 2012 Steele Pacini Vineyard Zinfandel from California’s Mendocino County and the 2012 Castello Monaci Pilùna Primitivo Salento IGT from Italy’s Puglia appellation. The steak house’s main wine list ($32 to $5,500 a 750-ml. bottle) is evenly split between New World and Old World, with the sweet spot averaging $125. Callahan aims for balance. “A program of this quality should have something for everyone who walks through the door,” he says. The sommelier focuses on keeping his wine list fresh and offers verticals, including 20 vintages of Château Lafite Rothschild and Barolo dating back to the 1960s. Callahan notes that popular California Cabernet Sauvignon is holding strong, but getting more competition from Washington Syrah and Oregon reds, while South American reds are slowing down. “We’re getting more calls for Spanish and Portuguese reds and even wines from southern Italy—the emerging areas of quality,” he adds. Top-sellers include the 2004 Elvio Cogno Vigna Elena Barolo DOCG Riserva from Italy ($170 a 750-ml. bottle), the 2009 Long Meadow Ranch Cabernet Sauvignon from Napa Valley ($198), the 2011 Beaulieu Vineyard Georges de Latour Private Reserve Cabernet Sauvignon from Napa Valley ($220), the 2008 Ridge Monte Bello Cabernet Sauvignon from the Santa Cruz Mountains ($337) and the 1989 Robert Mondavi Reserve Cabernet Sauvignon from Napa Valley ($341). Grill 23’s by-the-glass offerings range from $9 to $27 a 6-ounce pour. Popular choices are Hunt & Harvest Cabernet Sauvignon from Napa Valley ($15) and the Two Crows Pinot Noir from Oregon’s Willamette Valley ($16). Sparkling wine is a big seller by the bottle, notably the Champagne labels Pierre Gimonnet et Fils Brut ($186 a 750-ml. bottle), Laurent-Perrier Brut ($101) and Krug Grand Cuvée ($415).